Do You Have Trouble Digesting Dairy? Dairy foods such as milk, cheese and yogurt are an important part of a healthy diet, but many people have a difficult time digesting them. That's because their bodies lack the ability to digest lactose, the sugar found in milk and other dairy products. This may result in gas, bloating, indigestion, occasional cramping and diarrhea. 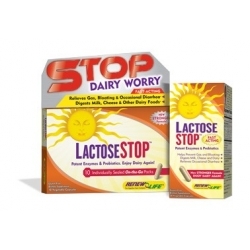 Lactose STOP is an advanced digestive enzyme blend uniquely formulated to help the body digest dairy foods. Plant-derived lactase, lipase and papain help break down the sugar, fat and protein found in dairy, and the exclusive LactoWise™ probiotic blend assists with the production of lactic acid, which helps digest dairy foods.